I implemented a short/long adjustment mechanism at the feedpoint side of the antenna. That basically adjusts the antenna length about 29 inches (0.73m). I did that to be able to cover the entire 20 and 40m bands with a VSWR under 2:1. The beauty of it is that I can easily adjust it without collapsing the pole. Of course, I only needed to adjust it if/when I wanted to work SSB. What I also discovered is that the short adjustment (antenna 29 inches shorter) lowered the VSWR on 17m to an acceptable level. Perhaps you can call this adjustment mechanism a “link” ;-). Go to my QRZ page and scroll down until you see the diagram and associated VSWR plots. Yes, links seem to make sense if you want 15m. It is interesting that I got 17m by just shortening the endpoint 0.73m. I wasn’t intentionally trying to tune it for 17m – it just worked out. These trapped EFHW antennas are certainly interesting the way everything interacts! And then you have antenna height and ground conditions that will have an effect on things. I’ve noticed that my VSWR will change when the wind bends my pole closer to the ground depending on activating in the treeline or on a rocky summit. I’m glad a now have a KX2 with internal tuner so I don’t have to worry so much about antenna resonance and such! My traps reduced the length of the wire required (which is nice) but also reduced the 2:1 bandwidth. Not a big deal if you have a tuner or only work either CW or SSB. Or, just live with reduced power ;-). attached, please find a sketch of how the antenna looks like in an inverted-L deployment as inspired by Brad’s description on his QRZ page, https://www.qrz.com/db/wa6mm, this time with the links shown. I drew this while Heinz was drafting his reply, so likely, his values for the position of the links are closer to the truth. But you have to tune the antenna anyway. My initial lengths for the 3-band version are for SOTAbeams antenna wire and an inverted-V configuration at a 6m mast. PS: I would expect that in particular on the short bands, the too narrow angle at the top would cancel out part of the RF energy. But I agree that an inverted-L is much handier in terms of deployment. The next Funktelegramm, April 2018, features a 6 page article about my new EGA30 antenna. 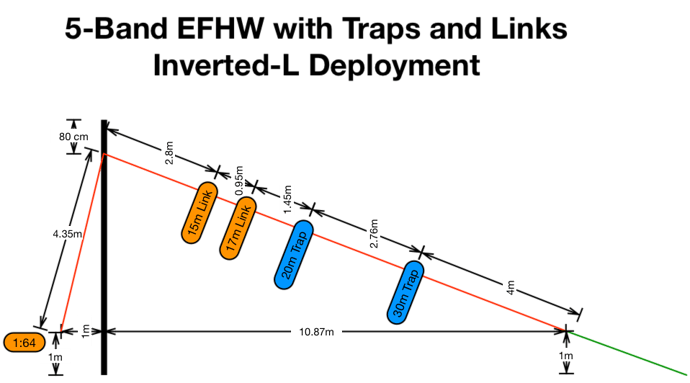 An end-fed antenna for 30/17/12m (WARC) with an overal length of 6,6m. Main focus is the background of end-fed antenna design: how to calculate and solve the math for a cascaded end-fed antenna.